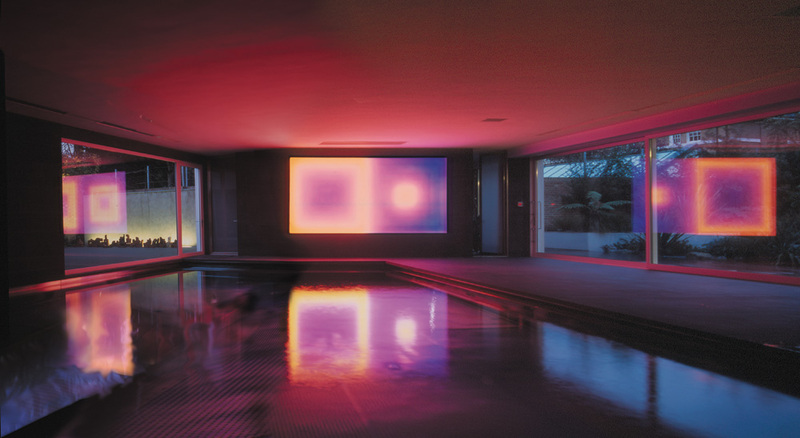 The owners of Haymarket Hotel had been taken to view an installation in a pool area [Narcissus] within a private house designed by A.H.M.M architects with whom i had collaborated. Their enthusiasm led to discussion of a commission. With the barest bones of site drawings at Haymarket, I proposed a simple horizontal glazed box to be set flush to the wall and half a metre above the floor, but importantly,taking up the entire width of the pool, so that there was a direct dialogue between the two elements. 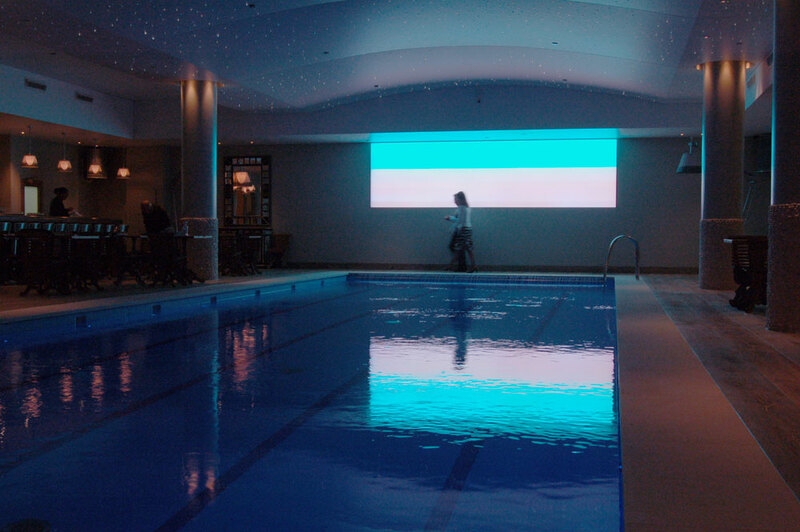 When considering any body of water, its reflective qualities become a crucial element of the proposed installation. 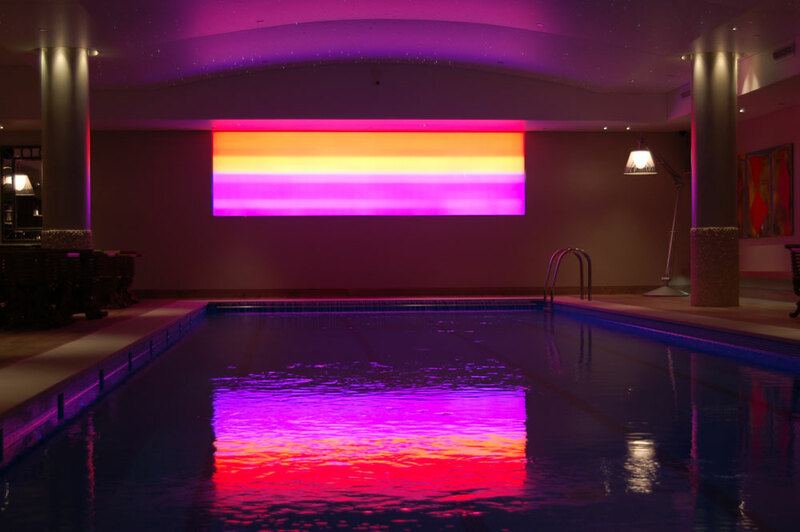 The intention was to create a work that would mirror in the pool and engage with the passing bodies of any pool user. I wanted the work to be as simple as possible whilst fulfilling certain criteria of engagement. 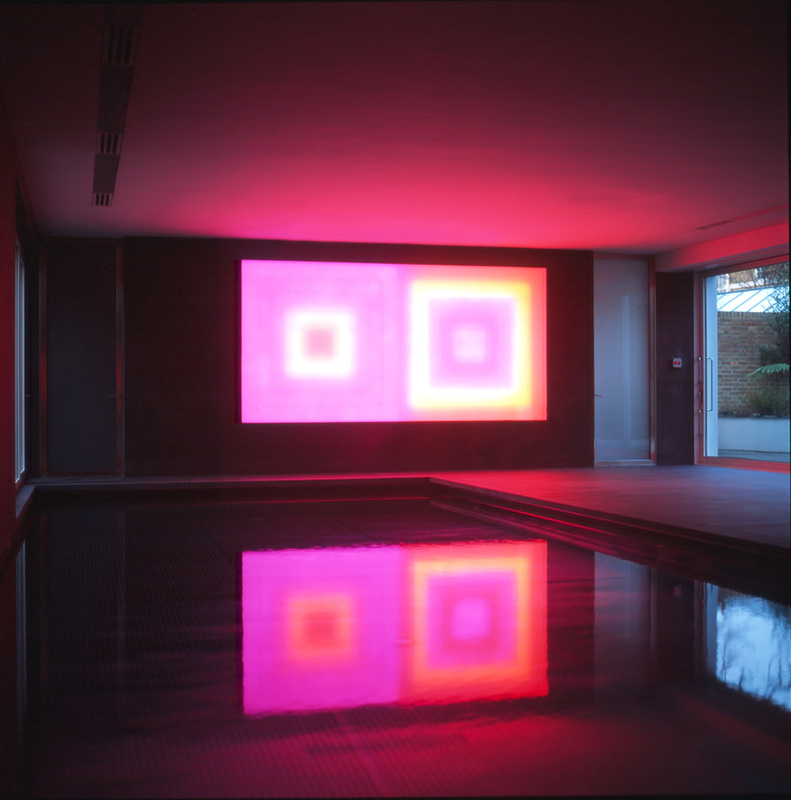 It was important to me that any viewer would sense that the work encompassed their visual field, that they felt almost surrounded by the liquidity of light, colour and water, achieving, to some extent, a dissolution of the boundaries of floor, walls, ceiling and self. The decision was made to allow a vast range of colour and configuration, but only within the constraints of horizontality. Having decided in broad terms the parameters I wished to achieve, I consulted in detail with a collaborator friend called Jeremy Lord, of The Colour Light company, and my agent Dominic Berning, who acts as a producer / facilitator for many of my projects. Jeremy is a talented electrical engineer and designer who has a healthy ‘can-do’ approach to possibilities and problems. We discussed the achieving of the desired effect, considering a range of materials and spacings to produce the work within the parameters of practicality, budget and aesthetics. 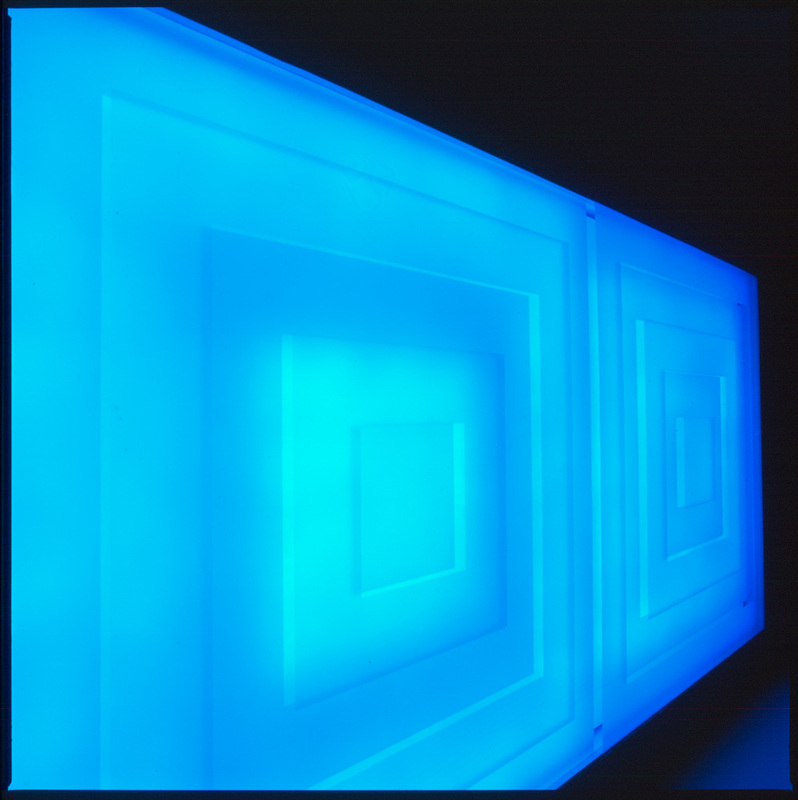 Engaging hours were spent moving and measuring diffusers, glass, LEDs and other elements to achieve the right balance of emittance and diffusion on the front face of the work. 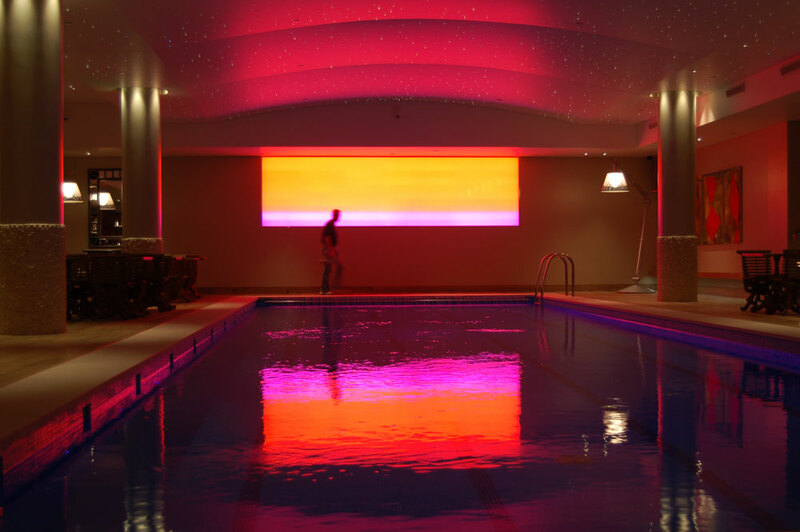 Jeremy assured me that my technical requirements were achievable,I designed the basic structure and appearance, whilst Jeremy designed all the electronic elements. The horizontality gave me a useful limitation on the possibilities the piece offered. 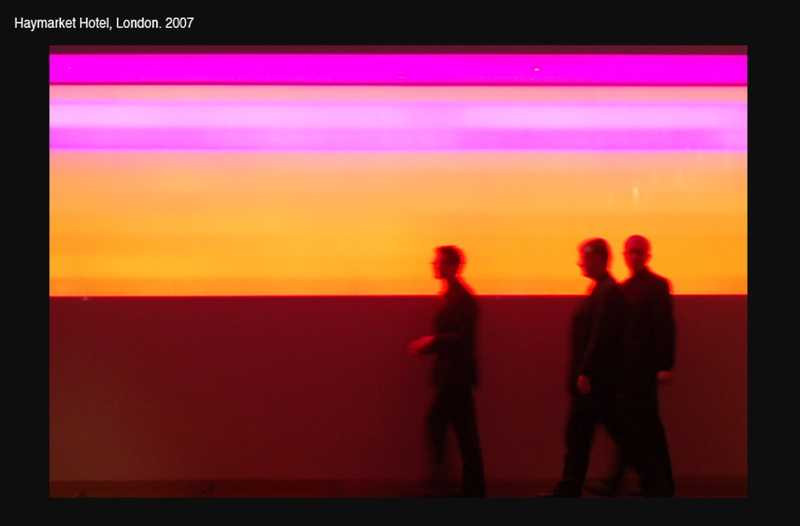 I tend to think that because technology within lighting is so adaptable and programming so available that many lighting schemes are allowed to do everything that it is possible to do, whereas my view is that some restraint adds a potency to perception. The work is divide into ten horizontal bars that can be programmed in almost any configuration. 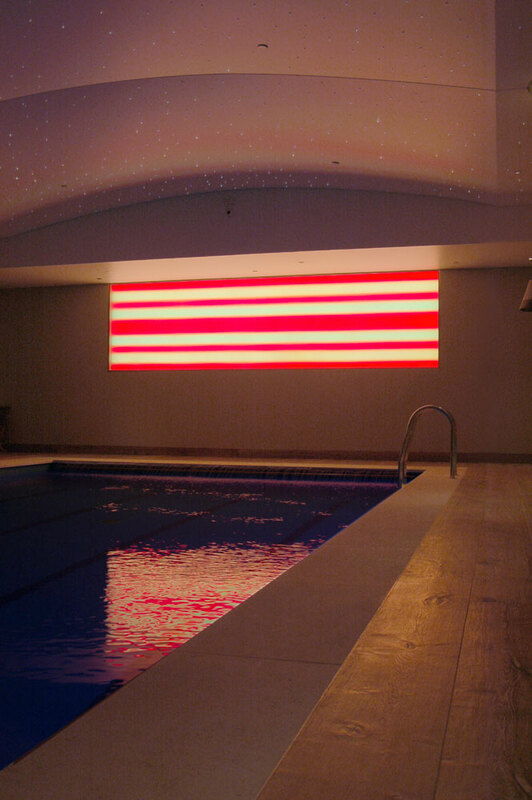 Each bar contains one hundred and eight red, green and blue Luxeon LEDs with a total of one thousand and eighty in the piece. Each row has a separately programmable colour controller. The construction of the the work was fraught with the sort of difficulties that beset complex sites in tight spaces in central london [ or any constrained place I dare say]. Just the lifting of a piece of glass five and a half metres long into position was a logistical problem that still gives Dominic nightmares, let alone belligerent, unhelpful glazing contractors and a very limited window of opportunity before the floor above the pool had to be sealed forever, meaning there would be no way for the glass to enter the pool space. Still we have become used to achieving that which many consider impossible and it can seem as though each new commission sets up a series of hurdles which have to be newly leaped. Eventually all the electronics, diffusers and glass were in place. The work had had to be raised from my original intended position due to structural vagaries of the site, which at the time seemed an important disappointment, but now seems that, although there is some loss, it is not as profound as I had once feared. 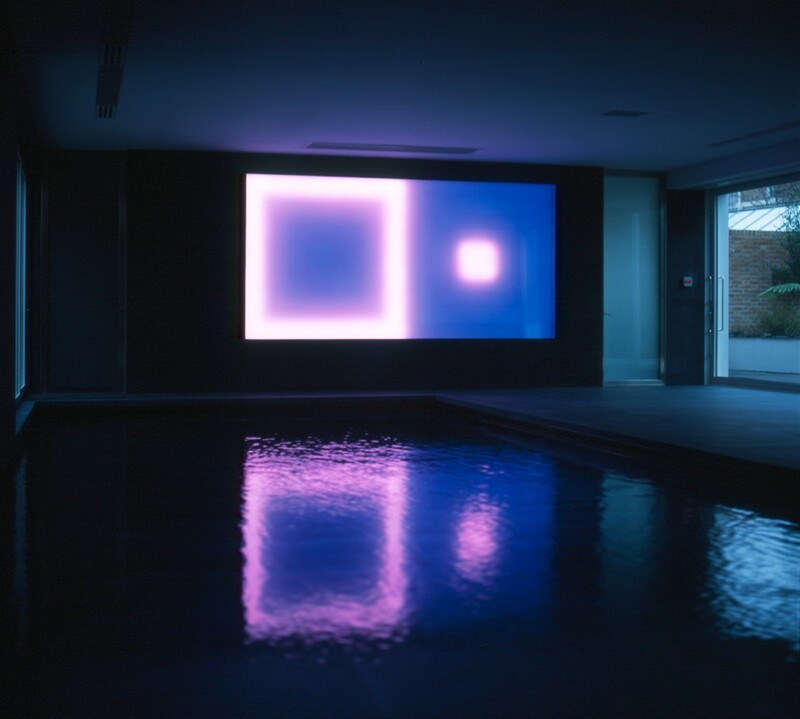 After some pleasant afternoons, drinking tea off silver salvers laden with crisp napkins, at the poolside, Jeremy and I had programmed some differing qualities of sequences and were able to enjoy the interaction of light, space water and human intervention as guests and staff wandered, sat or visited to view. 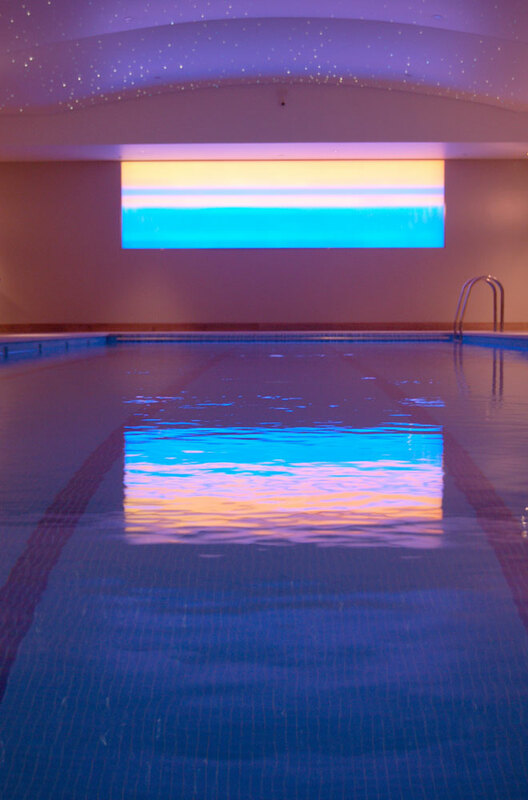 I enjoy the intensity of the coloured bands and blocks shifting and transforming the pool space, with the rippling water breaking the solid colours into flowing fragments of interwoven light and colour. As another figure apparently floats past, their slendered silhouette is aura’d with a coloured array expanding and shifting around them.